The worlds of health, technology and business converged at the 2nd annual Digital Health Summer Summit produced by Living in Digital Times. Approximately 175 industry leaders, representing life sciences, venture funds and incubators, mobile app developers, wearable tech, payers and physicians came together to exchange new information, share hard-learned lessons and best practices, network and move the fledgling industry forward. During a special evening event, Living in Digital Times welcomed attendees to San Diego, the digital health mecca, and notable San Diegans Rick Valencia, vice president and general manager, Qualcomm Life and Robert B. McCray, president and CEO, Wireless-Life Sciences Alliance recognized the city for its commitment to advancing the industry. WellDoc®, a healthcare behavioral science and technology company, announced the launch of BlueStar™, the first FDA-cleared mobile prescription therapy for Type 2 diabetes with insurance reimbursement. In coordination with the launch, Ford Motor Company, Rite Aid, DexCom plus other Fortune 500 companies announced their employees and covered dependents will be among the first to have reimbursed access to BlueStar. WellDoc president and COO Anand K. Iyer, PhD, MBA, a keynote speaker, made the official announcement from the conference stage and added, “‘Disruptive’ technology is only disruptive if it disrupts the outcome, not the process.” BlueStar will be reimbursed and adjudicated as a pharmacy benefit similar to other prescription products. Life Technologies’ Dave Daly, head of oncology, Medical Sciences, offered solutions where genetic testing will identify predispositions to various diseases and offer appropriate treatments. “We need to move in the digital health world from a system of generating data to an ecosystem of leveraging health data and physiologicial variables to enable better health through personalized behavior and lifestyle recommendations,” said Samir Damani, MD, founder and CEO, MD Revolution. Digital health has enabled patients to not only track their own wellness, but also receive motivation and targeted feedback, ultimately affecting their health behaviors. Mayo Clinic announced the development of Mayo Clinic Healthy Living, a new online offering for its commercial population health clients. The platform will create simple, personalized engagements that leverage Mayo Clinic knowledge to encourage positive change in lifestyle behaviors for improving or maintaining the health and well-being of users. Mayo Clinic Healthy Living is being built with the health expertise of Mayo Clinic, leveraging user engagement tools from Everyday Health. “Mayo Clinic has always been known for treating patients with serious or rare diseases, but now thanks to digital health, we'll be able to drive health and wellness for the general population,” said keynote speaker Philip Hagen, M.D., M.P.H., medical director of Mayo Clinic Healthy Living online. “Marrying trusted clinical expertise with proven consumer engagement tactics is the most effective way of harnessing the power of digital health,” said Mark Roberts, SVP & general manager, Health Solutions, Everyday Health. “The time is ripe for big brand consumer marketing and technology to come together and make a difference in the consumer era of healthcare,” said John Sculley, entrepreneur and investor; former president of PepsiCo and CEO of Apple. The Digital Health Summer Summit is a two-day workshop style conference that takes a deep dive into the elements of a successful digital health venture, providing the skills, tools and resource businesses need to thrive in the digital health space. This year's conference took place at the Omni Hotel in San Diego, CA on June 13th and 14th. 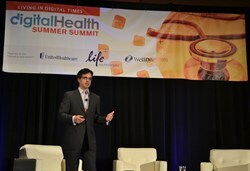 To see the full list of participants, photos and videos, visit http://summersummit.digitalhealthsummit.com/. Living in Digital Times also produces the Digital Health Summit at CE Week in York City, a half-day conference that takes place at the Metropolitan Pavilion on June 26th. On the agenda, opening remarks from Kyle Kimball, executive director, New York City Economic Development Corporation and the “Five Technologies We're Betting Your Health On.” For more information and to register today, visit http://www.ceweekny.com/conference/digital-health-summit/. Living in Digital Times produces conferences and exhibits throughout the year that bring together the most knowledgeable leaders and the latest innovations that intersect technology and lifestyle. Among their many goals is to help companies understand what it means to be a consumer in today’s digital world and stay a step ahead in identifying key trends in their given marketplace. Living in Digital Times produces the following summits, exhibitions and events annually at International CES: Digital Health Summit, Silvers Summit, Fitness Tech Summit, HigherEd Tech Summit, Kids@Play Summit, MommyTech Summit, Mobile Apps Showdown, Last Gadget Standing, FashionWare Show and the KAPi Awards. For more information, visit http://www.LivinginDigitalTimes.com.